Hello dearies!!! Welcome to November! Time really flies, now is already the last second month before bidding goodbye to 2013. So, how are you guys doing lately? Mirror mirror on the wall, who's the fairest of them all??? 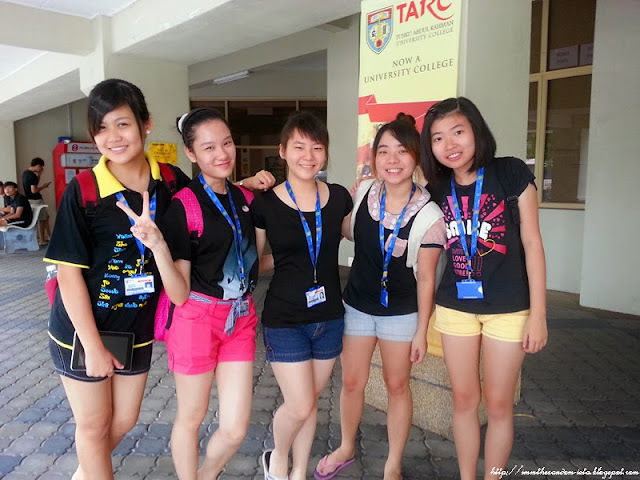 I would say that it is a fun-filled day as if it is not this particular project, I don't think we'll(classmates) make an attempt to gather with each other this way. Whether you agree or not, most of the time we tend to flock with our own gang and seldom hangout with other mates. So, I guess I've finally found something good about this subject despite most of us tend to doubt its importance perhaps this is one thing that could bring togetherness and foster our relationship bond with our classmates. Totally had fun as I'm not the driver for that day yay! car pooling is like one of the best thing for me hehe...especially if I don't know the place well, washing and playing with the hyperactive doggies etc.!! 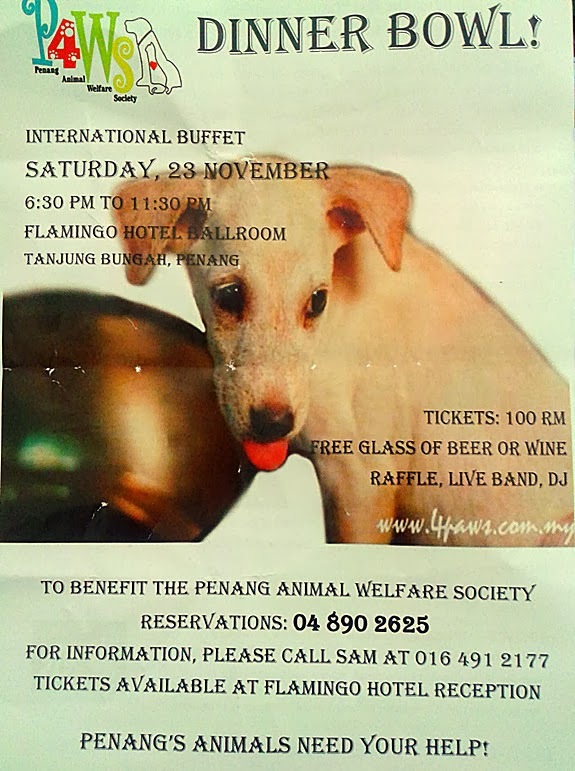 So, if you are about to own a doggie as your pet, instead of buying it why not considering to adopt from 4PAWS? You may check out for details about them at their website here or also at their Facebook Page for latest updates. 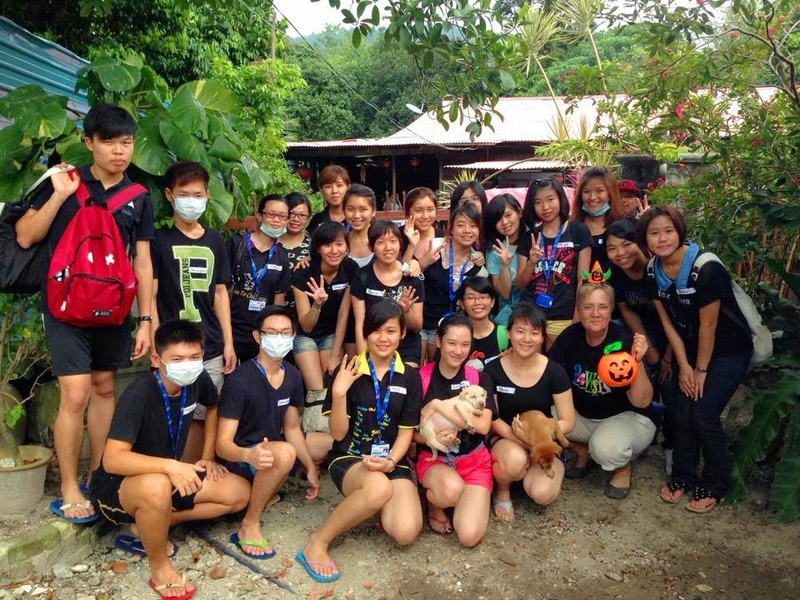 Upon walking into the dog shelter you'll be welcome by various species of dogs! Due to that, I have to put on my face mask before entering as I have very sensitive nose/sinus, dust, fur & haze to name a few are those killer that would caused my nose to face doomsday. 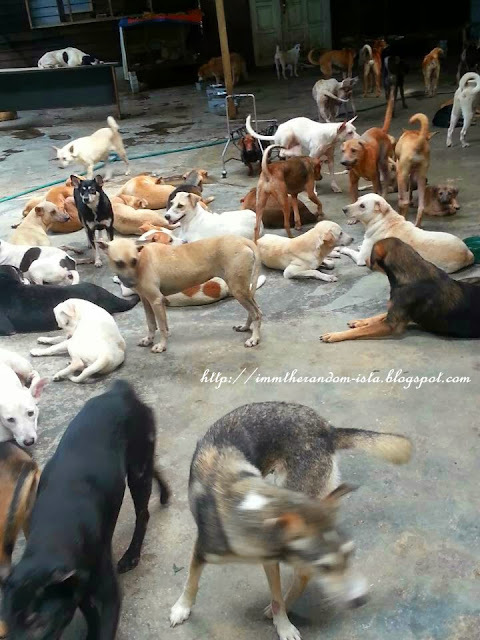 ~ Aside from the dog odour, the dogs there were very tame and I would say well behaved because they don't bite but of course they'll get a lil hyper as a sign of welcoming us visitors. Thus, its very usual for them to sniff here and there or jumping up and down but lucky thing they don't really bark at people, yes they do bark but they are not the type that will stare and bark at you furiously, if you get what I mean. Now lemme show off to you a bit how many puppies I've carried on that day! It's a record breaking step for me to have them in my arms as I was one a lil kid who's super duper afraid of dogs!!! Believe or not? I tend to shout(as thunderous as whenever I see cockroaches), run everywhere, jump onto sofa/chairs, step on ppl's legs and tried to climb on them just to avoid DOGS & of course burst into tears because of those dog got excited (lick, jump here and there with their scratchy paws) == reflecting back I'm like so dumb. As I grew older I started liking dogs and tried to play with them but then I never learn how to carry dogs. I was too afraid that I might hurt them as I really don't know where should I grab them and what if their are uncomfortable in the position I'm carrying them? Later I'll get bitten for nothing and so never really carried one till I visited 4PAWS. :D "Therefore I officially declare that I'm not longer that scaredy-cat that would go panicky because of dogs which means that I've successfully overcome my 3rd degree of fear ;)" yay! Cuteness overloading right!? Not only that two lil puppies but the only blue T-shirt lady of the day whom we used to address her as '亲爱的'！which literally means 'my dear'. lol! Look carefully & you'll notice my blueish lips & teeth cuz I have monster candies! :P LOL! Look at the puppy Yong carried, its actions was like it can't wait to get off her arms :P unlike mine blur but still steady! "These two 8 week old puppies were thrown in a garbage bin at Straits Quay by someone very irresponsible! The pups were in PERFECT condition - no fleas, beautiful skin and fur. They were lucky to be rescued by a lady named Theresa. 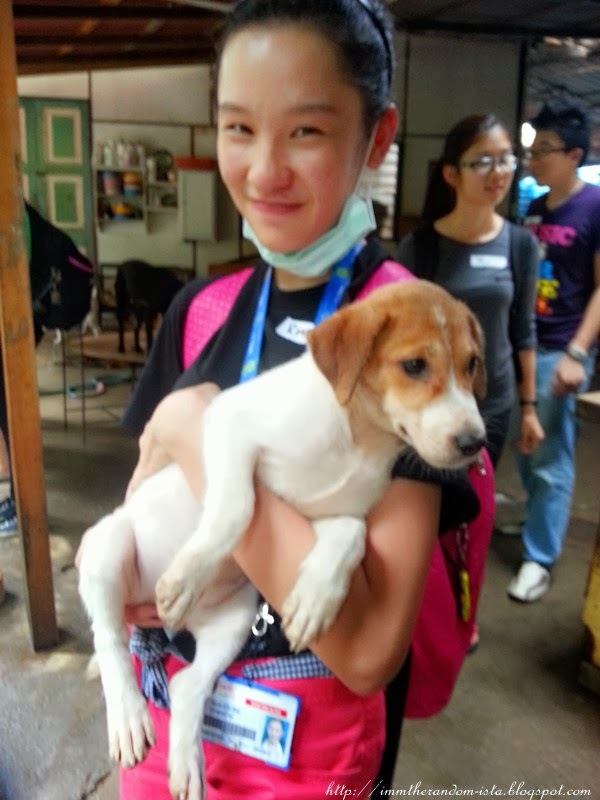 She brought the puppies to 4PAWS yesterday with her daughter Charmaine. That was how these two female puppies got their beautiful names. They were even luckier when they were immediately adopted yesterday! The two furry babies came in the morning, went out in the afternoon. They never even enter the shelter actually! 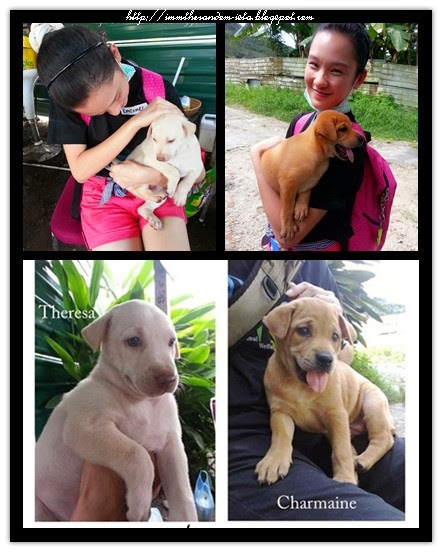 The white puppy was adopted by a wonderful family, with 2 little boys Wei Jie and Wei Sheng who love dogs and promised to help take care of the little pup. 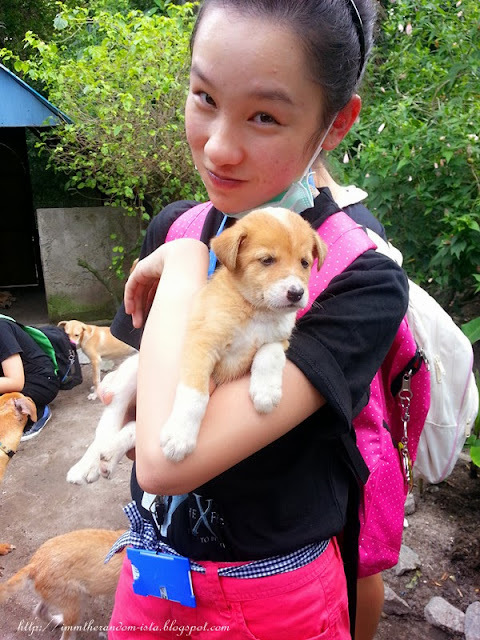 Everyone fell in love with the brown puppy too - Li Lian, a very committed and passionate 4PAWS volunteer decided she had to take her home. We are so happy for everyone including the two very fortunate furry kids! 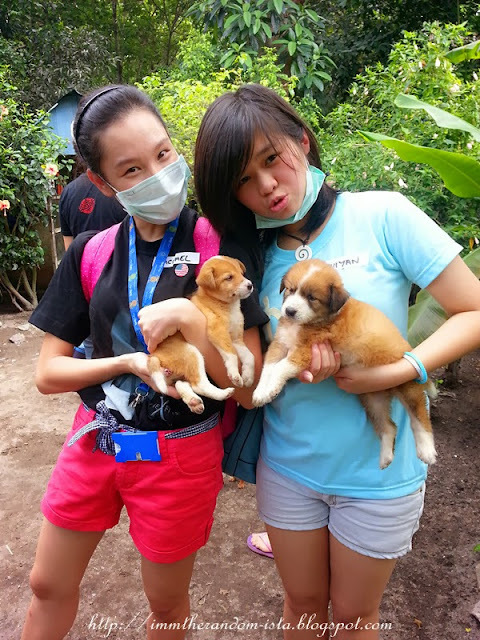 (Photos by volunteers Fiona and Joey Tan)"
Speaking of cuteness, I totally lost off to this two! Those two furry kids are so adorable right!!? How on Earth the owner are willing and able to abandon them?? Btw, I really miss carrying them in my arms. The warmth of their petite body, cute nails, small and smooth paws, little floppy ears & silky smooth fur made me enjoyed molesting...hehe...I mean patting them. They were ♥ my first love at the first sight ♥but in reality I only believe in hate at the first sight rather than love :P Sounds so negative but then I really don't get what's all about love at the first sight which are constantly being rave in dramas specifically Kdramas, do you? Our class photo of the day!